Categorized as: Africa, Education, Girls & women, Grantee, Our Partners, Poverty Alleviation, Stories, Youth & Tagged as: Akilah Institute, Burundi, Gender issues, Genocide, Nadine Niyitegeka, Rwanda, Technology on October 25, 2014. 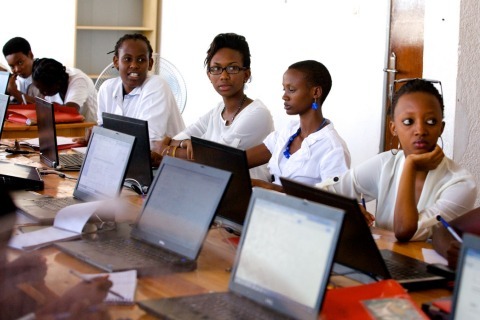 Editor’s Note: Akilah Institute provides education and training for young East African women and equips graduates with the skills and experience necessary to be successful professionals in the region’s fastest growing sectors: information technology, entrepreneurship, and hospitality management. 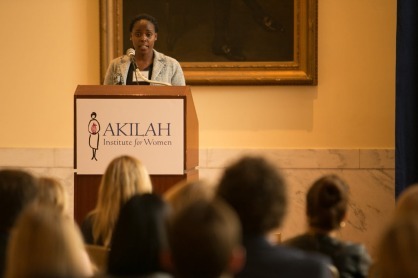 Founded in 2009, Akilah graduated its first two classes with a 90 percent average job placement. Their alumni earned incomes 5X higher than the national average, and 1/3 become heads of their households. 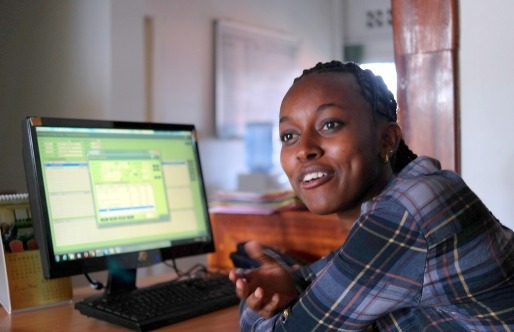 Nadine Niyitegeka, Akilah’s newest team member and alumna, shares how education through Rwanda’s only all-women college gave her the confidence and professional opportunities to change women’s lives across East Africa. “I’m honored to be here with you tonight to share the story of how I joined Akilah and how my life was changed. At Akilah, we believe that women deserve the same opportunities as men to get an education, get a good job, start a company, and make decisions in our government. We want to contribute our skills and knowledge to our country’s economic development. Students at Akilah’s Burundi campus. The educational model is unique because the instructors use team based learning, we are pushed to think critically, asked to defend our ideas, and speak in public. And we learn skills in technology, business, and communication that prepare us to go out and get jobs in the private sector as soon as we graduate. Like many of my classmates, I’m a survivor of the 1994 genocide. I survived because I took refuge with my mom and siblings in a church in the capital of Kigali. There were days where the killers came to pull people out of the church and once they even selected my mom. But she hid under a chair and they forgot about her. There was another day where a grenade was thrown into the church and I can still remember all the bodies burning. Someone found me in the rubble screaming and helped me reunite with my mom. I’m lucky to be alive. Akilah student in a group learning session. Growing up, we lived in extreme poverty. There were days when I didn’t eat for a day or even two. My mom was nervous that I didn’t have enough food in my body to do the hour and twenty-minute walk to and from school and said that she didn’t want anyone to find me lying on the side of the street because I had fainted. But I wanted to go to school and so I pushed through the hunger pangs. When I came to Akilah, I barely spoke a word of English. Like most of my fellow classmates on their first day, I was painfully shy. I couldn’t imagine standing up in front of even two or three people to share an opinion, or speak in public. I’m proud to say that I am able to support my entire family with my salary. My mother doesn’t have to worry about missing a meal again. I pay for my siblings to go to school. And my fellow graduates are doing the same for their families. Akilah helped me discover hidden talents I didn’t know about. I am now a leader and a public speaker. Standing here in front of you, speaking to a large audience in a foreign country in a foreign language is something nobody would have expected of me, least of all myself! Providence Ingabire studied Hospitality Management at Akilah and graduated in 2012. After graduating, Providence was employed full time by a tour company in Kigali that caters to German- and English-speaking clients. In our society, women keep quiet, talk only when they are asked questions, and defer to their husbands. They are mostly relegated to staying in the home after 6pm, cooking and cleaning. Akilah students and alumni are changing this! We have become role models to our friends and families. I’m forever grateful to Akilah for changing my life, and I will spend the rest of my life trying to help other girls to transform theirs as well. Watch more about Akilah’s recently launched Information Systems certificate and importance of tech skills in the emerging East African economy.